Somewhere on Water Street, between the honeybee facade of Buzzy’s Pizza Emporium and the House of Rock’s stony threshold lies a curious entryway dressed in colors of cheddar and black. It’s Chedd’s Gourmet Grilled Cheese, whose storefront opened Sep. 12, leaving no question as to what kind of fast-casual comfort food and atmosphere it offers. While the restaurant’s fare might give first impressions of a one-trick pony, Chedd’s surprising menu and exclusive location on the Water Street gamut may serve as a nightlife hotspot, completing for a slice of Water Street’s fantastic and notorious late night afterbar noshing scene, or better yet, to serve UWEC students and downtown workers during the business district’s lunch hours. While company founder Dirk Bruley lives out in Fort Collins, Col. nowadays, and enjoys Chedd’s restaurants in Sioux Falls and Austin, he grew up just north of La Crosse in Brice Prairie. 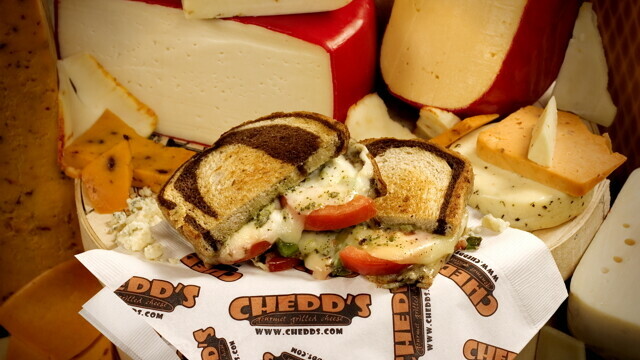 Chedd’s makes a point to feature Wisconsin cheeses in their recipes, exhibiting more than 35 cheeses, soups, and brats from America’s dairyland. These include Green Bay’s Belgiosio cheeses, Widmer cheeses out in Theresa, Wis. (located between Fond Du Lac and West Bend), and Richfield’s Burnett brand just outside of Milwaukee, largely thanks to its relationship with the Wisconsin Milk Marketing Board (a Wisconsin-based NPO with aims to increase the reach of Wisconsin’s dairy products). So in some respects, the time for Chedd’s to open a restaurant in the state it celebrates the most has been a long time coming. And while the classic grilled cheese sandwich is on the menu, most options push the conventions of what a gourmet grilled cheese sandwich can be. The menu provides 25 sandwich recipes plus a build-your-own sandwich option offering 35 types of cheeses from Horseradish Havarti to Chipotle Cheddar and eight types of breads including focaccia, marble rye, sourdough, and classic standards wheat and white. The restaurant’s cooking hardware goes beyond the technology of typical sandwich shops’ convection ovens and panini presses, which cannot replicate the toasty golden bread slices we all remember from our favorite grilling pans at our home stove, to provide that gooey, delicious comfort food sandwich. The menu also offers a generous selection of meats including bacon, ham, pastrami, salami, and roast beef for a flavor kick, with vegetables, condiments, and dressings. Brat options, mac ‘n cheese, salads, and soups, including the dipping classic tomato basil, fill out Chedd’s’ menu. Beverages include Coke products, coffee, and some local beers and wines. There will be a grand opening celebration some time in the near future, but as of this printing there is no proper date set. Stay tuned to upcoming Volume One issues’ Food & Drink calendars for more information.